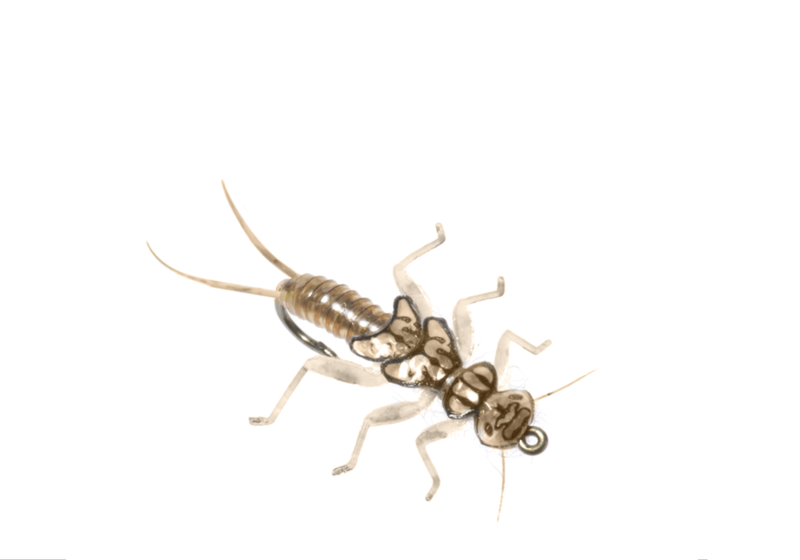 Stoneflies are among the oldest orders of insects on the planet. All their life is spent in and around water and that makes them an obvious prey to many fish species such as brown trout, rainbow trout and char. They are among the first large insects to hatch in the season. To the fly fisherman the nymphs are most important. Stoneflies inhabits moving waters, such as rivers and creeks, but can somemtimes also be found in areas of lakes were currents or waves makes the water move. They need clean water with alot of oxygen for there survival and are often found close to the shore, both as nymphs and as adults. The life cycle consists of three stages. The egg, the nymph and the adult stonefly. In most parts of the world, the adult stonefly is a random piece of food to the fish. However, in the northwest USA for example, some of the large sized adult stoneflies will attract the fish. At most occations the angler should focus on using fishing flies that imitates the stoneflies nymphs. Often called the only ”year around fly” due to the fact that they are active all year around. Imitations of the nymph are great flies to use even if there are no stonefly hatch going on. They work as great attractor flies. Most stoneflies, both nymphs and adults, are either brown/rust, dark brown, black or yellow in colour.